Pill popping may not be your thing, and if you’re rushing from here to there, you may find yourself forgetting to take your supplements with a meal. So take out the proverbial middleman by getting your daily dose of antioxidants in a potent potion made out of fresh vegetables and fruits. You can even choose to supplement one, two or all three of your meals and go on a full-on juice detox just to give your digestive system a rest. The benefits of a juice cleanse are not only a cleaner overall system and a sharper mind, but also a lot more energy. 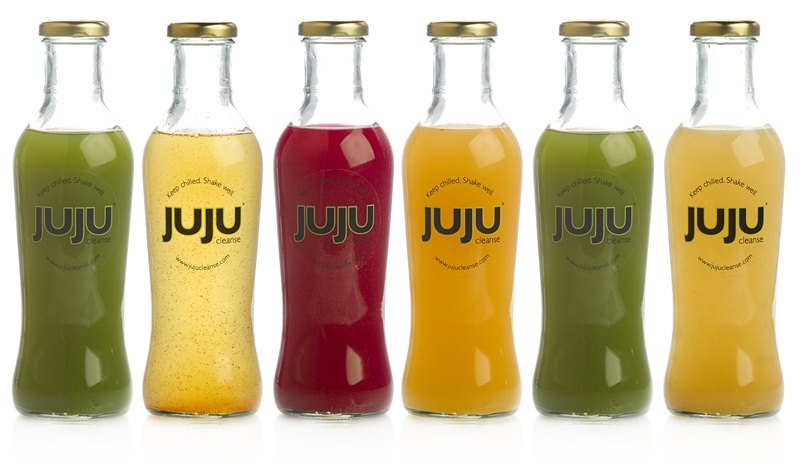 Juju Cleanse has great-tasting juices that can ease you into it (Level 1) or take you all the way with their mostly green Level 3 concoctions. Their website Jujucleanse.com is also highly informative, which may tempt you into doing a full-day or even five-day juice detox. Should you decide to go liquid before the onslaught of parties and party food, make sure you take time to ease yourself into it and out of it. Want a taste before you commit? You can pop by their restaurant Juju Eats in Makati (www.Jujueats.com) where you can grab a juice drink and combine it with a freshly made salad or wrap and take them with you. You can also call 0917-5763012 for more information. Since we are on the subject of nourishment, if liquefying your life may be too extreme (or seemingly impossible for you) as Christmas draws near, then you may want to look at supplementing your meals with vegan food. In other words, fare that is animal-product free. 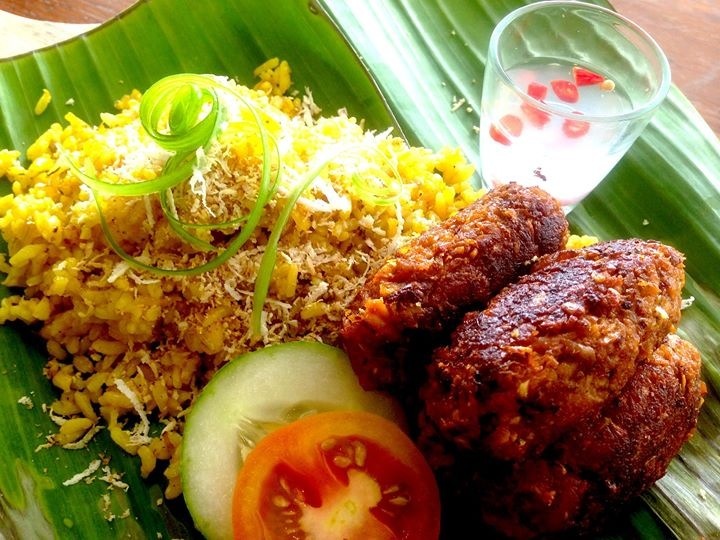 Edgy Veggy (www.edgyveggy.ph) has a full menu that can be delivered to your doorstep, or you can grab a bite at their commissary in Pasig. 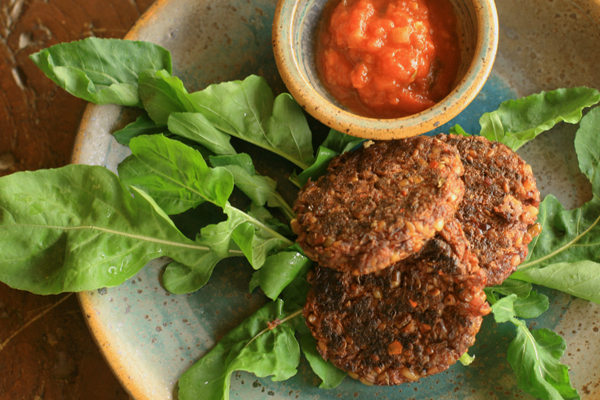 Their newest offering, vegan longganiza (P180) is made with mushrooms, non-GMO tofu and spices, plus every order of this particular meal gives 10-percent of its proceeds to the I Can Serve Foundation. None of their dishes are made with preservatives or animal fat and they serve generous proportions so even the hefty eater can feel satisfied without feeling the usual heaviness and sluggishness associated with eating commercially produced fast food. Meals that contain fewer preservatives and fewer chemicals also lessen the risk of adrenal fatigue syndrome, which is both an energy and mood killer. Spread the joy of the season by starting from the inside with healthier food choices when possible. For more information or to order, call 0917-8474831. Hustling and bustling or huffing and puffing throughout your day? Already so wrapped up in the frenzy of multitasking that you can’t imagine what winding down feels like? If you’ve spent hours looking for the perfect gift for someone else, then give yourself the gift of some R&R through Restorative Yoga. Yoga? You cringe, as you are barraged with images of pretzel-like twists and standing on your head. Yes, yoga, but restorative yoga is 75 minutes of pure passive bliss that focuses on getting the body to rest. Since we are normally in fight or flight mode (maybe even both at the same time), our parasympathetic nervous systems get a much-needed “break” through this class which requires no muscular effort. Using the support of the floor and certain props, you can remain in a calm and relaxed position (light twists, elevated legs, etc.) for a longer amount of time, giving your mind, body and spirit a chance to rejuvenate and recover. It’s like a siesta for your system and gives you a chance to shut down and disconnect from the frenetic world outside. Check out (Urbanashrammanila.com and their two branches in Brixton (661-9642) and Bonifacio Global City (869-9642). A monkey mind is what a majority of us possess. This means simply that we process what seems like 10,000 thoughts in a day. The total is actually much higher than that: it has been documented that we have about 60,000 thoughts a day! Imagine the stress you carry cerebrally daily; no wonder the term “brain fog” has become more the norm, and it’s hitting us at any age, when it used to be reserved for those who were well into their 60s. So how to free yourself from a mind that can’t seem to shut up? Meditation and breathing exercises are the tools to find your center and be the master of your mind, rather than be the slave to it. 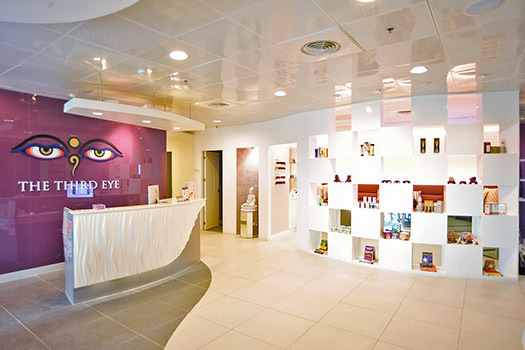 The Third Eye Wellness Center (http://thirdeyeonline.com/) located in Bonifacio Global City is a new all-in-one wellness center that offers therapeutic practices that are beneficial for one’s outer and inner being. Its Transcend Spa offers massages, facials and care for your nails, a vegetarian café (Chakra Café) where you can order light fare as well as freshly made smoothies and energy healing modalities such as Theta DNA Healing, Access Bars, Crystal Layout, Tarot Card Readings, Past Life Regression and the like. The energy healing modalities allow one to clear or remove limiting beliefs or blocks that may have been taken on from childhood. If you’re feeling like it’s you against the world, then check out what’s happening in your internal world first. You can also call 808-2984 or 0917-6362800 for more information. 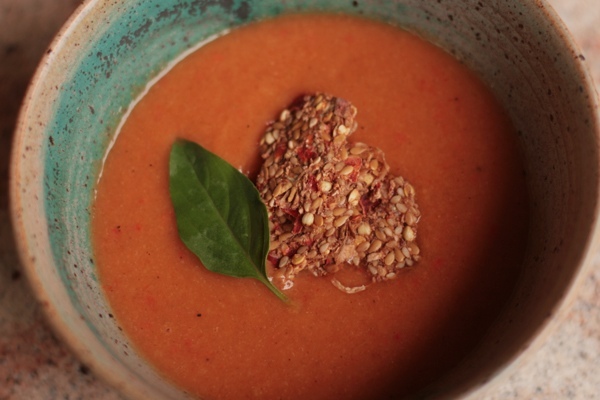 Soup opera: Break your fast with vegetable soups that are packed with goodness. There is probably nothing more musical to one’s ears than the words “You look great! You’re so payat!” For most of us weight-obsessed individuals, the battle of the bulge takes up much of our daily conversations with friends, family and even total strangers. Have you ever gotten the “Hey! Have you lost/gained weight?” in place of a simple “How are you?” Our foreign visitors often have to be briefed that the mention of their current state of, well, body mass index is as normal as talking about the weather and they should not take offense. No matter what time of year it is in our country, thin is always in. I still remember those (including myself) who go on one ridiculous regimen after the other in the months leading up to Christmas because, we all know, even an Olympian will not be able to resist the temptations laid before him on a noche buena spread. I can safely say I’ve been on both crazy to not-so-crazy diets, ones with ridiculous anagram meanings, to ones that were healthy, but needed medical supervision in order to do it without going stir-crazy. I had come to a part of my life wherein I was just plain old tired of yoyo-ing from one dress size to another. Not to mention that drastic dieting does take its toll on your skin and well-being. Sure, you can lose a dramatic amount of weight if you want to in a very short period of time, but if you didn’t change anything else about you (say, your attitude towards food and/or stress) you’ll just binge your way back to overweight glory in no time. Looking at the mirror and wondering where the skinniness of my youth went was not the best way to start or end the day. It was early in this year that I made the conscious decision to pay equal focus to both my mind and my body. So I enrolled in yoga teacher training and for that whole month, I went vegetarian. Thirty days of intense yoga plus lighter fare started to make a difference in my overall well-being. Since some yoga poses require you to carry your own body weight, a shrinking body mass helps your practice dramatically. That month I must have dropped almost 10 pounds and was feeling strong and more aware of my body, so I then decided to do a detox, choosing Stanley Burrough’s Master Cleanse. A caveat: I am not in any capacity a nutritionist, but I have learned to do my due diligence before starting something new. The Master Cleanse, known more popularly as “The Lemonade Diet,” works on the premise of cleaning out your system completely and providing a brand new spanking “you” inside, after a minimum 10-day rest period from all the food and beverage that you may be addicted to. If you think you aren’t addicted, see how long you can go without sweets, coffee or even processed foods such as white rice or cheese. This cleanse asks you to rid yourself of your bad food habits by committing to only drinking a concoction of organic lemons, water, cayenne pepper and grade B maple syrup, combining it with light to no exercise, and rest. Going into the diet, you have to start to wean yourself off of meats, alcohol, caffeine and processed foods, etc., so that by day one you can go through your day with a thermos or two filled with liquid gold. This detox is not for the fainthearted. You have to commit and realize that a majority of your eating habits (the bad ones) are due to your emotional attachment to food, drink and even the social relationships you associate with eating. The first two days are relatively easy; pride is what can carry you through the first 48 hours, plus by the second day you may already lose two pounds, which feels pretty good. It’s Day 3 that is the biggest hurdle (at least in my case). Much like a drug addict or alcoholic goes through withdrawal symptoms, I got a headache and the sweats (others got stomachaches or feverish symptoms) and you feel like you need a food “hit.” You just have to keep drinking the lemonade blend and even more water and, if you find yourself constipated, an herbal laxative tea. Days 4-6 is when it begins to dawn on you how little you need food, or at the very least, how much food and drink you over-indulge in, because you are now feeling more alert and strong considering it’s been days since your last swallow of solid food. Days 7-8 are also challenging because you may start to argue with yourself, and say things like “I’m more than halfway done, I can quit now.” Or “I’ve already lost almost 10 pounds, I can stop this!” You can lose about 1-2 pounds a day on a Master Cleanse,” but bear in mind that 60 percent of what you lose is water weight. By Day 9-10 you are feeling stronger than ever, lighter, and if you have had problems sleeping, you will find that you don’t need to sleep as often or as long and still feel energized. Not to mention your skin and eyes are brighter than they’ve ever been. If 10 days is your maximum, then start to wean yourself back to the non-liquid intake slowly. I would highly recommend the super food smoothies of Edgy Veggy (www.edgyveggy.ph) or the slow-cooked vegetable soups of Real Girl Toy Kitchen (www.realgirltoykitchen) to help you break your fast over Days 11-13. Everyone’s experience with The Master Cleanse is different, so let me just share mine. I lost about 11 pounds during the time period and gained back four. But, since my appetite and stomach had decreased in size, I was no longer as hungry as I used to be, and my metabolism had also increased and hasn’t decreased since the fast. I am at my lightest weight now, having lost an additional 15 pounds since going off the fast in May and I’ve dropped three dress sizes. A detox is for an overall rehaul that can result in not only cleansing one’s body but kicking dependence on food to make one feel good. Check out www.themastercleanse.org to see if this is the detox for you. Meatless Monday today, and normally I spend my weekend meat-ing out, almost like a bear about to go into hibernation. This weekend though, I found myself after early morning yoga and meditation wanting my greens in a big way. Not just a fluffy salad which I can just make at home, but rather, creatively crafted vegetarian fare that packs in a gamut of flavors and textures! Corner Tree Café on Jupiter St. seemed to be the best option. I had gone many years before when it first opened and truth be told I was far from impressed. The servings were small, the taste was so-so and overpriced. Due to a recent re-taking of the Art Of Living (AOL)course where we were recommended to go vegetarian I went back (after all those years) to have lunch with my AOL classmates. 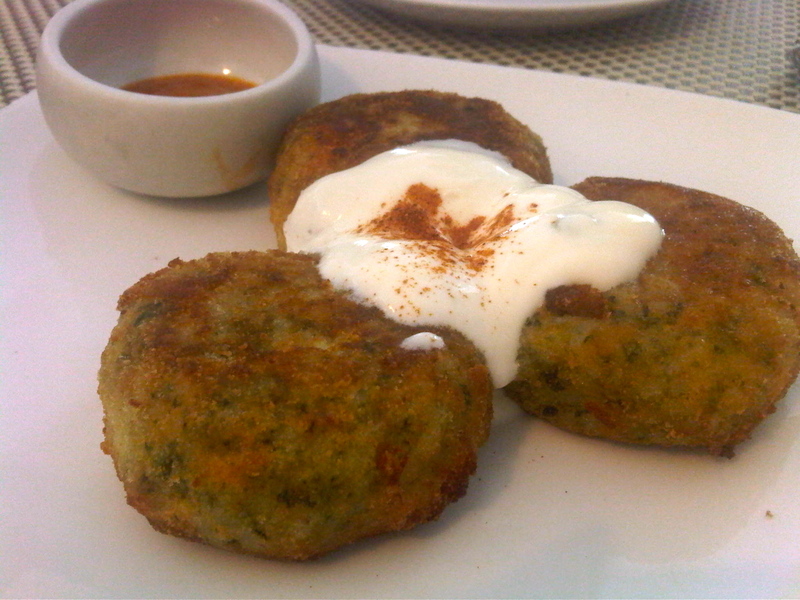 The food had changed, dramatically, and I loved and savored every bite of my Kofta with tomato sauce and rice dish. I enjoyed my food so much that I even made a date with an ex-colleague to have lunch there the following Monday. What followed was pretty much as a disaster as it turns out the resto was closed on Mondays! With our green dreams crushed, my friend and I relocated to the Mall were we proceeded to have a four cheese pasta and dessert. Fast forward to a Sunday where my yoga mate and I found ourselves happily seated at a corner table in Corner Tree, nearly salivating at the mouth in anticipation of what we were going to put in it. And a cup of lentil soup that tasted even better with a squeeze of fresh lemon. Tangy and tasty! 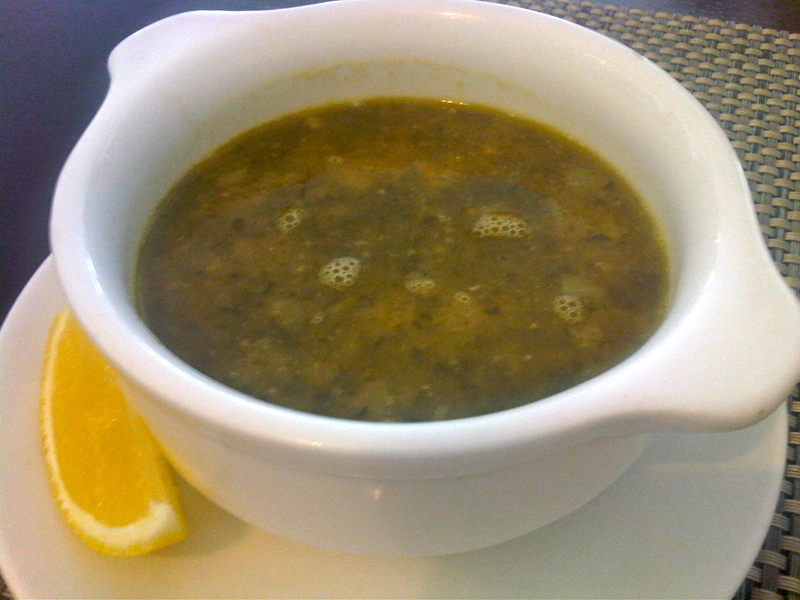 Hot lentil soup to soothe the soul-lemon squeeze a must! At the end of this marvelous feast I indulged in dessert,which came in the form of a triple chocolate and almond biscotti with earl grey tea and soy milk. This pretty much set me up for the entire day food-wise! 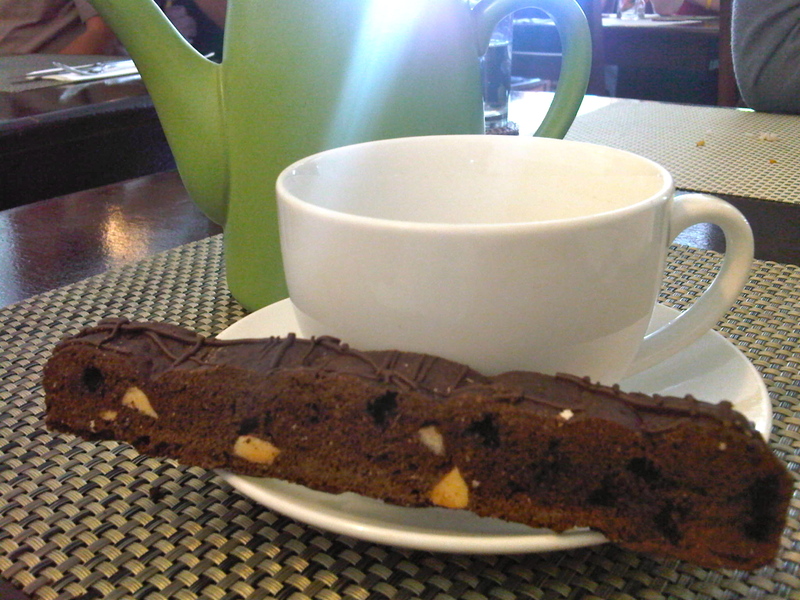 Suffice to say this biscotti was an absolutely delicious way to end my Corner Tree experience. It was moist, yet nice and crunchy with a perfect blend of chocolate and almond. Not too sickeningly sweet and heavy. 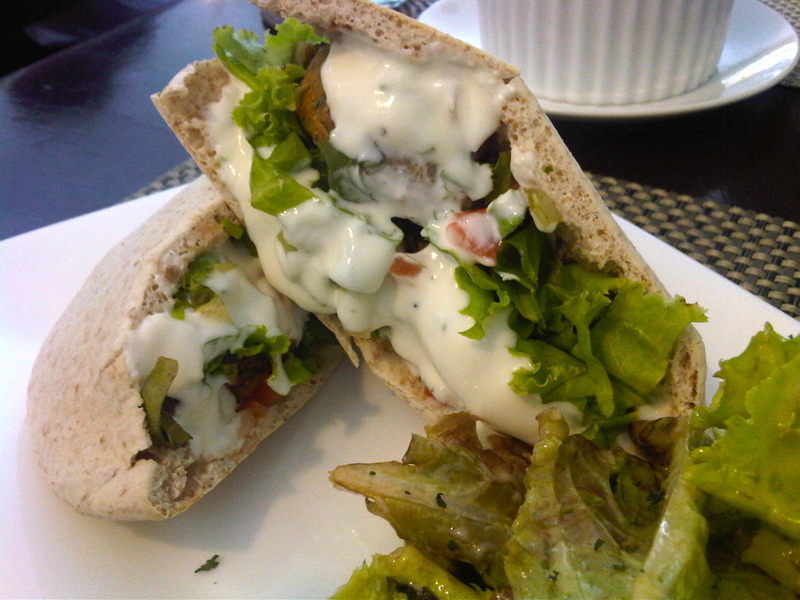 Corner Tree Café 150 Saturn St cor Jupiter St. Bel-Air Village, Makati City (02) 897 0295 ‎. Open Tuesdays to Sundays from 11am to 9pm. Over the holiday crush, my family and I were entertaining friends visiting from overseas and as the conversation moved to the phenomenon that is social networking, a cousin commented, “It’s only Pinoys who post pics of what they eat.” It was an innocent remark but highly observant. Even I am guilty of posting all the delicious dishes I have had the pleasure of consuming, I do it so often that I’ve already dedicated two albums just for my food posts. Scanning through my own pics and other amateur food bloggers I realized, wow, we do love to eat, but food posts featuring healthy meals were rare to non-existent. Suffice to say, after all the feasting my body needed a break, as it takes way more effort for it to digest heavy meats, refined carbohydrates and sugars. I looked to Edgy Veggy for a respite from all this “bad” eating. Owner Denise Celdran told me she was starting a new lifestyle program called “Thrive,” inspired by the book by vegan triathlete Brendan Brazier. The program, which Celdran described as “rehab for the body,” consisted of loading up on foods that are rich in nutrients and could help in the prevention of high-blood, high cholesterol, diabetes and even cancer — all lifestyle-related diseases that stem from stress and the consumption of nutritionally “empty” food. Smooth operator: a smoothie rich with antioxidants The program is not necessarily meant for weight loss but that could definitely happen in the long-term as it aids in removing cravings and addictions to sweets, refined foods and junk foods. “I really recommend that people be on this program for a minimum of five days, usually with a pre-detox, detox and post-detox. After 15 days there should be a noticeable change in their cravings,” explains Celdran. 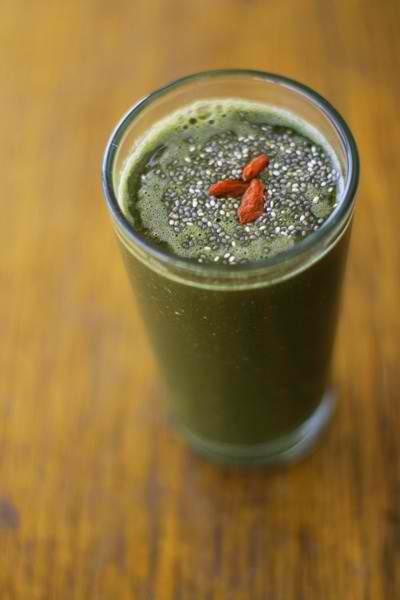 The pre-detox is five days of smoothies and salads eaten before their regular meals and in lieu of sweets and junk food. This is meant to crowd out their usual diet with healthier alternatives.They are also encouraged to exchange white rice, sugar, bread, etc., with whole wheat or whole food counterparts. The daily ration of smoothies, snacks and salads are delivered every other day. The detox period is five days of mostly raw (60 percent) vegetables, with whole food snacks (flax crackers, granola bars, chocolates, etc.) plus a few cooked meals (stews and burgers). Then the last five days is like the pre-detox where they still take the smoothie, snacks and salad before their usual meal. If you stay true to the program the cravings for refined foods should be much less and there will be more willpower to stick to a mostly ‘‘live food‘’ eating regimen. I wasn’t sure if I could take on 15 days of this, so I went for the bare minimum of five days in the hopes that I could shed a little weight or at least bring down some of the bloating I had acquired from too many days of deep fried foods and booze. 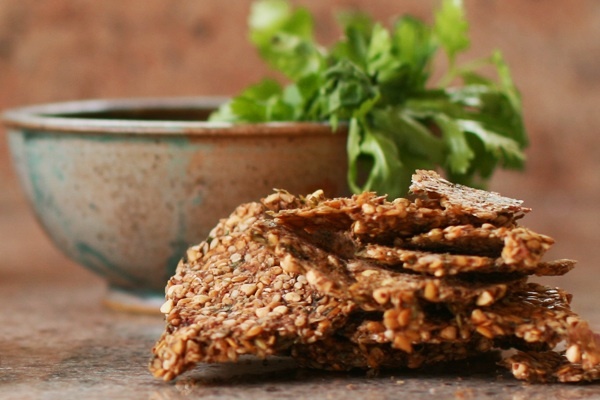 First of all the flax seed crackers that were sent with every meal were amazing, they really helped with my “snack attacks” since they came in a variety of flavors: sweet, salty and spicy. 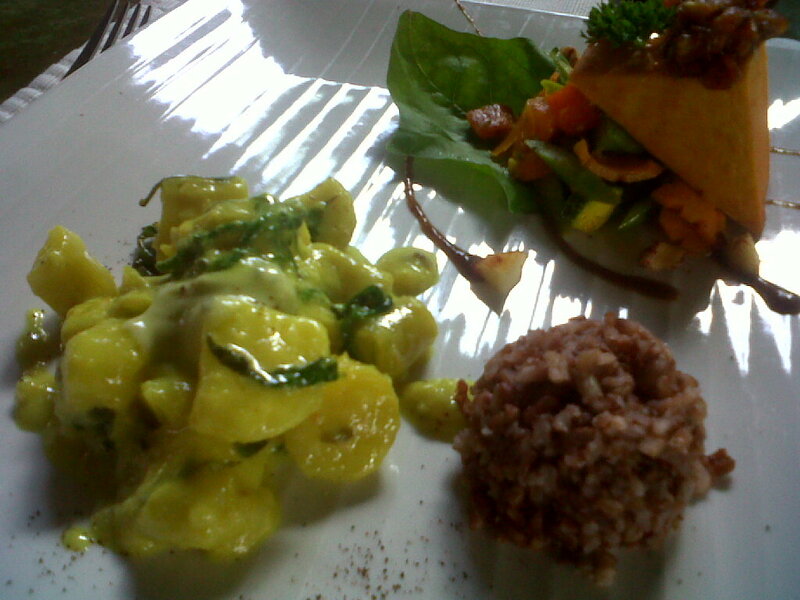 I’ve eaten Edgy Veggy prepared vegetarian meals before and loved the taste of the ulam type meals. I felt full even with just half a serving. The key to the entire program is the Superfoods Smoothie which earns its name from being made up of 12 super foods that help suppress the appetite, increase energy and are made up of many antioxidants and anti-inflammatory components. I was told it was inflammation that causes aging and most diseases. I am definitely a meat lover, and as the five days passed I came to the happy realization that I didn’t miss it at all. For those not familiar with Edgy Veggy, it is completely vegan with most of its ingredients grown organically in Celdran’s farm in Batangas. Celdran feels so strongly for the program that she insists on a personalized customer relationship so she can see to it that their cravings and addictions to food that do not do a body good are addressed. Each day I observed my body, I wasn’t hungry and I was definitely full of energy, waking up early and working out with increased stamina and strength. It was amazing how light I felt so quickly. I didn’t lose weight at the end of that short program but considering I was eating three full meals (breakfast, lunch and dinner) two snacks and a smoothie, that was a welcome outcome. Had this been a “normal” foodie week for me there would be dramatic weight gain for sure. Even without the weight loss my body was obviously digesting food better as my bloating had gone down considerably, not just in my midriff area but also in my arms. It could have just been my imagination but I felt leaner after a workout and since Thrive was the only thing I was doing differently that week I attributed it to my dietary switch. It looks like doing the 15-day full program is now in my near future. What better way to recalibrate inside and out for 2012? * * * The Thrive Program costs P10,000 for the full 15-day program. P1,000/day for four days or more or P1,100 for three days or call 0917-8202081 or email deniseceldran@yahoo.com for information. It’s easy to eat. It’s even especially easier to eat food that tastes like heaven but gives your body hell in terms of digestion. Due to my work I often find myself eating out on a regular basis — too regular, in fact — and over the course of the last couple of months I have found myself to be borderline overweight, and lazy as heck. Finally getting up to exercise on a regular basis was excruciating, and the reflection that stared back at me from the floor-to-ceiling mirrors at classes I attended was rather disheartening. Still, I thought to myself, what’s life without good food? True, I will always enjoy eating out, eating with friends, and even eating alone, but balance is a being’s natural inclination; it was time for a food time out. To be honest, when I embarked on a four-day retreat to The Farm at San Benito, it had crossed my mind that my daily dishes were going to consist of vegan food that was predominantly raw. I had signed on for a much-needed yoga and meditation break and was only reminded a day before by a friend that the food was going to be very different from the rich indulgences I had peppered my Facebook wall with. There is one restaurant in The Farm called Alive! that champions food that is all homegrown, “live” (think loads of vegetables, fruits and nuts) and created onsite, so it’s as fresh as fresh can be. During my stay there, I even attended an Alive! food preparation class, where the chef shared with us some recipes we could do at home (I’m no cook, but it was nice to have the recipes) in the event we wanted, let’s say, a healthier salad dressing or non-dairy cheese (yes, very possible with nuts, miso and sea salt). The menu had gotten a lot more extensive: one could choose from the à la carte portions (their pesto spaghetti is a winner) or their set menu, which changes on a daily basis, for lunch and dinner. You can choose a two, three, four or go all the way and get all five courses. Don’t scrimp on a healthy shake or smoothie while you’re at it. A caveat, though: you are definitely eating food that is extremely beneficial for you in all aspects, you are providing your body with much-needed enzymes and nutrients, but the dishes do contain calories — so don’t think a five-course meal is going to make you lose weight, but it certainly is nowhere near to the weight (and whatever else) you’re going to gain from a “finger lickin’ good” dish. Unless specified, you will not eat anything that has been cooked over 40 degrees Celsius on the menu. Why? It is believed that uncooked food retains more of its nutritional properties, and is easier to digest, giving your metabolism a much-needed rest. You will not find piping hot soup but lower temperatures will be compensated by taste as spices and herbs give you a very flavorful broth (as I experienced with the very delicious hot and sour soup) and even the potato curry was spicy enough without burning your tongue. Your plate is filled with so many colors and so many textures that you forget it isn’t cooked and you do get full, especially if you indulge in a drink like The Real Teal, which is made out of acai berries and high in antioxidants. If you decide to stay a night or more (highly recommended) breakfast is another delight. 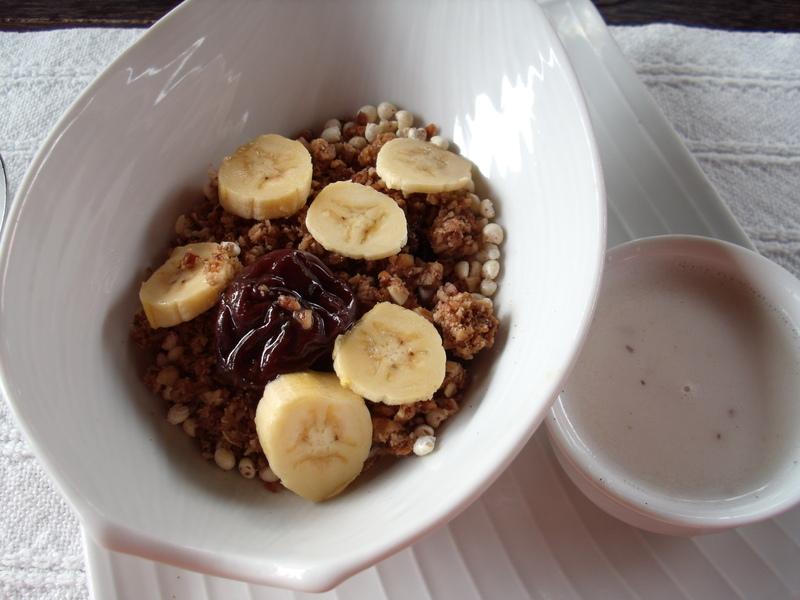 I enjoyed their homemade cereals so much — the crunch and the sweetness of the granola, for example, made me not want to add coconut milk as I did not wish to dilute the flavor. Fresh fruits are abundant at all times even in liquid form so you can sit and sip them to your heart’s content if you’re not hungry yet. 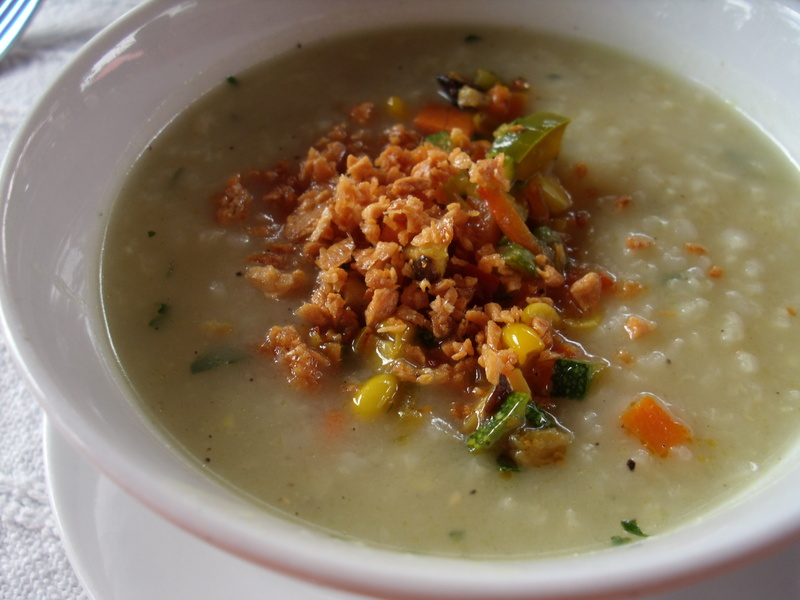 In the event that you want your food more cooked, then the vegetarian arroz caldo is a must try; it is so tasty you will not look for the chicken bits at all, and the smell alone will make you feel like the dog in Pavlov’s experiment. So, what happens with all this (sometimes) raw food? Like I mentioned before, your metabolism takes a breather, as does your digestive system, so be ready for frequent trips to the toilet. Not to get into TMI mode, but your body needs to expel toxins so with this kind of diet that has so much fiber (optimal hydration is essential) you’re helping it out in a big way. In a nutshell, you’re getting the junk out of your trunk. A bonus? You will probably sleep like a baby, something that you may not have experienced since you were, in fact, a baby. Enjoy your trip to the raw side. For more information on The Farm at San Benito go to http://www.thefarm.com.ph.